The first-ever Honduran to don the red hat, 64 year-old Cardinal Oscar Andres Rodriguez Maradiaga, the archbishop of Tegucigalapa, has become a reliable source of good copy since his elevation at the mega-consistory of 2001. Adding to his cred in this pontificate is the presence of the magic letters "SDB" -- he's a member of the Salesians of Don Bosco, just like B16's Secretary of State, his former #2 at the CDF and a number of his episcopal appointees that almost increases by the day. 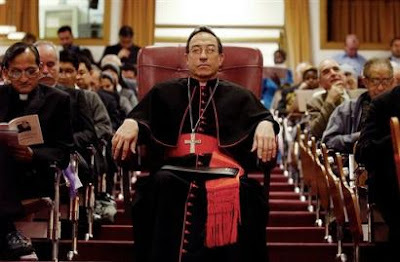 Although the bloc seeking a Latin American reportedly coalesced around the Jesuit Cardinal Jorge Mario Bergoglio of Buenos Aires at the 2005 conclave, it didn't keep Rodriguez from the top of the press' papabile heap, to which he'll likely return in the next go-round. TIME's Jeff Israely caught up with Rodriguez during the Brazil trip and dubs him the continent's "rising" prelate. Q. What's your view of Latin America's current political leaders: Lula in Brazil, Chavez in Venezuela, Morales in Bolivia, and others? A. People say Latin America is turning to the left. I say that it is simply seeking social justice. I look at my own country, and so many want to go to the United States because there is no work in Honduras, because there is no development. Q. But isn't there a risk in religious leaders getting involved in politics? Q. Do you agree with the Pope's statement that pro-choice Catholic politicians merit excommunication? A. It is canon law that everyone who works for abortion is excommunicated. It's not something the Pope invented. If you favor abortion, you are outside the communion of the Church. And it was necessary to say that. There are people in Mexico saying I am Catholic and I support abortion rights. This is a contradiction in its very essence. As a teacher of the Church, the Pope has a responsibility of teaching when something happening is wrong. Q. Do you agree with bishops who deny giving Holy Communion to the these politicians? Q. Will we see a Latin American Pope some day? A. It would be a great blessing. It's not a question of nationality, [but] is simply because of the situation in the world, and what it would mean to have a Pope from the Third World. The Holy Spirit saw that the Church in Europe is in great difficulty and so it gave us a Pope who knows these problems well, and is a great intellectual who can dialogue at the highest level with anyone. I know the Spirit will shift in the direction of other countries and continents in the future. The Word as "Staple Diet"